Modesto is a city in, and is the county seat of, Stanislaus County, California. 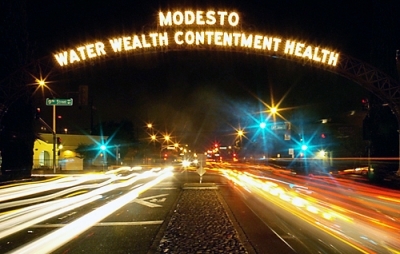 With a population of approximately 201,165 at the 2010 census, Modesto ranks as the 18th largest city in the state of California. Modesto is located in the central valley area of Northern California, 90 miles north of Fresno, 92 miles east of San Francisco, 68 miles south of the state capital of Sacramento,66 miles west ofYosemite National Park, and 24 miles south of Stockton. Modesto, a 29-time Tree City USA honoree, is surrounded by rich farmland, lending to a ranking for the county as 6th among all California counties in farm production. Led by milk, almonds, chickens, cattle, and walnuts, the county grossed nearly $2.5 billion in agricultural production in 2007. Locally, Modesto is home to the critically acclaimed Gallo Center for the Arts, Prospect Theater Project, The Modesto Symphony Orchestra, The State Theater, the Modesto Nuts (a Colorado Rockies MLB affiliate), the Amgen Tour of California, and the Modesto Christian High School 2009 State Championship Football Team. The Xclamation Festival (X-Fest), has become the city’s largest entertainment and cultural gathering, recently celebrating its 10th year. The event in 2009 had an estimated 16,000 attendees enjoy music and food on the streets of downtown Modesto. Modesto also encompasses various cultural and social diverse schools. Among the oldest are Modesto Junior College (MJC), Thomas Downey High School, Grace M. Davis High School, and Modesto High School(MHS), being the oldest high school in Modesto. Embodies a rigorous academic and physical curriculum for students such as the International Baccalaureate program, AVID, and more. Modesto was immortalized in the 1973 George Lucas film American Graffiti. The award winning film captured the spirit of "cruising" and friendship, on 10th and 11th Streets in 1962 and lead to the world-wide revival of 1950's nostalgia leading to the TV show Happy Days and the other spin-offs. Ron Howard, Harrison Ford and Richard Dreyfuss starred in the film. The soundtrack was a huge success. Director George Lucas is a native of Modesto, graduating from Downey High School in 1962.